The 709-carat rough "Peace Diamond," found in 2017 in Sierra Leone's Kono district. Photo by Rapaport Group. During a trade mission to Sierra Leone that involved a group of 29 international diamantaires and jewelers, Martin Rapaport, Chairman of the Rapaport Group, presented a proposal to the government of Sierra Leone that he believes would optimize the country's diamond industry. In a media statement, Rapaport said the proposal includes a systematic and sustainable business model that "will optimize the benefit of Sierra Leone’s alluvial diamonds for the diggers, their communities, and the government." The plan involves giving artisanal diggers the opportunity to sell the diamonds they find through a legitimate government channel. "The weekly auctions will provide consistent cash flow to the artisanal sector every Thursday. 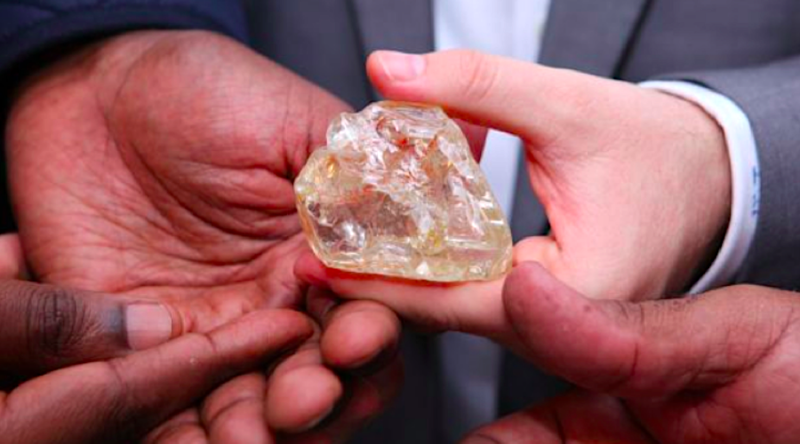 This cash flow will support a strong microeconomic grassroots multiplier effect"
The channel would be a diamond auction center in Koidu, Kono district, where the famous 709-carat rough "Peace Diamond" was found in 2017. The center would act as a hub where artisanal diamond diggers or finders will deliver the diamonds they find to a “government receiver,” as it is contemplated in section 167, subsection 5 of the Sierra Leone Mines and Minerals Act of 2009. The receivers would then have to supervise a weekly transparent and competitive public auction where the diamonds may be sold to the highest bidder. "This will ensure that the diggers and the government get fair market value for their diamonds. The auctions will be open to all sellers, including licensed and unlicensed diggers. Bidding will be restricted to licensed dealers and exporters," Rapaport's proposal reads. Based on the model used for the sale of the Peace Diamond, the international trading organization says the strategy requires some legal changes to be implemented. "The law requires that 60% of the value of the diamonds be given to the government. There should be a provision ensuring that 25% of the 60% (i.e., 15% of the value of the diamonds) goes to the communities where the diamonds were found. Furthermore, the 40% given to the diggers should be tax-free. Such benefits to the community will ensure there is incentive for the diggers to bring their diamonds to the government," the document reads. According to Rapaport, the proposed model should guarantee that government diamond revenue provides vital infrastructure to the communities where the diamonds are found.